Rajan qualified from Manchester Dental Hospital in 1993, and worked in London for 8 years before setting up Care Dental Windsor, with his wife Sunita, in 2001. He is a member of the PREP panel - a group of select General Dental Practitioners that evaluate the very latest dental technology for Professor Burke at Birmingham Dental Hospital. Since 2003, Rajan has been an approved enhanced Vocational Trainer - training new graduate dentists (Foundation Dentists) in our approved training Practice. This has been extended in recent years to Therapist training & Dental Core Training for dentists with a specialist interest. 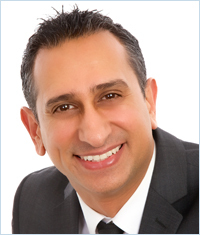 In 2013 Rajan was selected to be the Training Programme Director for the Berkshire Dental Foundation Training Scheme, based at Wexham Park Hospital, Slough. This role includes responsibility for delivering the study day programme for 13 Foundation Dentists based in the area, and assessing & signing them off at the end of the year. He has a particular interest in Aesthetic Dentistry, with extensive postgraduate training in veneers, ceramics, alignment & teeth whitening. Outside of dentistry, Rajan has a passion for sports, music, travel & his family including the family dog Woody.